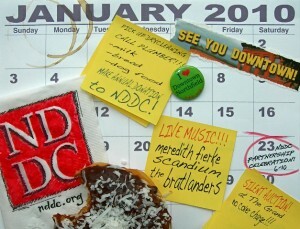 On Saturday, January 23rd, from 6 to 10 p.m., the NDDC will hold its Annual Partnership Celebration at the Grand Event Center, 316 Washington Street, in historic, scenic, authentic downtown Northfield. It’s also the organization’s tenth birthday party. The event (which is free and open to the public) features four local bands, performing original material: Scandium, Meredith Fierke, Matt Arthur & the Bratlanders, and TV & the Bellered Yellers. The NDDC recognizes and celebrates this wealth of local artistic talent. The NDDC was created in late 1999 and has been working for the cultural, economic and social vitality of the downtown for ten years. Although in recent years the Northfield Economic Development Authority has provided financial support for specific initiatives, the majority of the organization’s support comes from individuals who and businesses that recognize the importance of the downtown to the overall health of the Northfield community. The NDDC believes that downtown is for everyone. Whether you were born and raised here or moved here last month, whether you live in a historic neighborhood or a newer part of town, whether you love old buildings or prefer new music, you are welcome in downtown Northfield. In addition to the four fantastic bands, there will be hors d’oeuvres, a cash bar and many of your friends, neighbors and people you’d enjoy meeting. So come on down(town) and join us in celebrating the NDDC’s birthday, our community’s rich musical talents, and our beloved downtown. For more information, contact NDDC Executive Director Ross Currier at (507) 663-0319 or rcurrier@nddc.org.